The "right" answer to just about any issue related to virtual worlds depends upon one's particular point of view. Requirements, priorities, preferences, values, concerns, etc. vary greatly from one stakeholder group to another. That's why I think its a good idea to try to see topics from multiple perspectives. It not only helps us understand the big picture more clearly, but also makes us more holistic advocates for our own interests. But there's an even more expansive perceptual shift that I hope the avatarian community as a whole will take together, and that's moving from a short-term, platform-centric perspective to a long-term view with the greater good as our ideal. 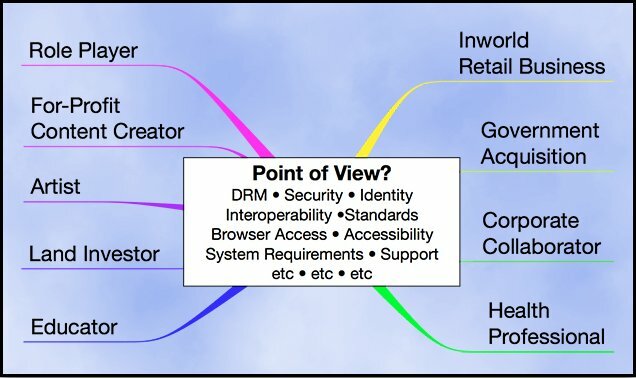 This shift away from the typical issue du jour mentality was really brought home for me in "Do We Really Need Standards For Virtual Worlds", a workshop I attended at the Federal Consortium for Virtual Worlds Conference. The session began with a discussion on practices and extended in the second half to cataloging the barriers standing in the way of more widespread virtual world adoption. This work will continue in the fall with a two day mixed reality workshop help physically in Los Angeles and virtually across a number of worlds and platforms. I'll share more details about the upcoming event as they're available.